His death was confirmed by Marina Garde, the executive director of theAbraham Lincoln Brigade Archives in New York, who said Mr. Berg was believed to have been the only survivor left of the nearly 3,000 quixotic young Americans who volunteered for the Spanish Civil War in a bloody prelude to World War II. About 800 of those who volunteered were believed to have been killed. Mr. Berg, an unreconstructed Communist, was a 21-year-old union-card-carrying hotel dishwasher in 1937 when he spotted a billboard for the brigade and, through the Young Communist League, enlisted. After cobbling together bus fare to New York, he boarded the French luxury linerChamplain for France. The war was an audition by proxies for World War II, with a democratically elected leftist government under siege from rebels led by Gen. Francisco Franco. Through the Communist Party, the Soviet Union was supporting the Republicans, or Loyalists. Nazi Germany and Fascist Italy fortified Franco. Franco won the war in 1939 and installed a dictatorship that endured until his death in 1975. The United States was officially neutral during the war. Mr. Berg slipped into Spain in January 1938, crossing the snow-capped French border. He went on to install communication lines for front-line antiaircraft artillery near Barcelona, defended the mountain town Teruel and fought at the Battle of the Ebro, the biggest battle of the Spanish Civil War. He was wounded that August when Italian bombers missed a railroad station and instead struck a monastery where he and others were billeted. Shrapnel from the bomb remained in his liver for the rest of his life. The Munich Pact, which appeased Nazi Germany by allowing Hitler to annex portions of Czechoslovakia, left many Loyalists demoralized. Mr. Berg left Spain and returned home early in 1939. Unlike a number of other starry-eyed recruits to the Abraham Lincoln Brigade, Mr. Berg never outgrew his devotion to underdogs. He joined the Communist Party USA in 1943, became a vice president of his local chapter of the N.A.A.C.P., organized farm workers and protested the war in Vietnam and nuclear weapons. “He was always attached to just causes,” a friend, Pat Cervelli, said in an interview. Delmer Esley Daniel Berg was born in Anaheim, Calif., on Dec. 20, 1915, of Ukranian, Dutch and Bavarian ancestry. His father was a tenant farmer. He left high school in Manteca, Calif., as a junior during the Depression (auspiciously, given his stint in Spain, after studying Latin and “Don Quixote”) to help support his family in Oregon. He later moved to Los Angeles, where, tempted by recruiters for the military and the circus, he joined the National Guard. He legally bought his way out of the Guard for $120 and got a job washing dishes at the Roosevelt Hotel in Hollywood, when he saw the billboard advertising for Lincoln Brigade recruits. After returning from Spain, he was drafted into the Army and assigned to an antiaircraft battery in New Guinea. He was later discharged because of his shrapnel wound from the fighting in Spain. After the war, he worked as a farm laborer and a landscaper, and started a cement and stonemasonry business with one of his sons. He and his wife, June, lived in the Sierra Nevada foothills. She died last year. Survivors include his sons from an earlier marriage, Ernst and Tom, and two grandsons. 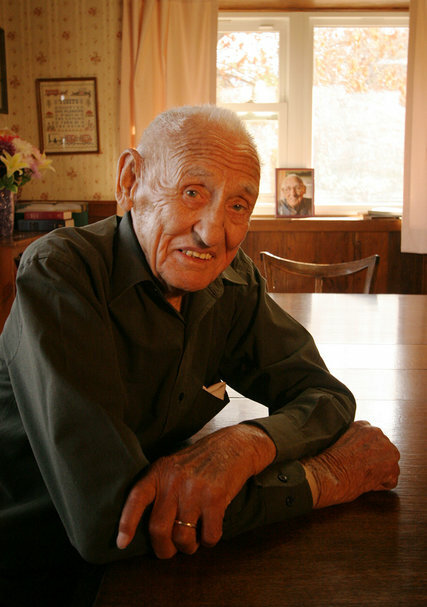 In 2014, according to the Archives, after the death of John Hovan of Rhode Island, Mr. Berg became the only known survivor of the Lincoln Brigade.